This is quite lovely in the tub, having many colors like a rainbow, ultimately turning the bath a golden hue. Lush catalog description: Take it Slow.Find sanctuary in slow, unfurling layers of deeply relaxing olibanum and ho wood.cassie absolute, olibanum, ho wood oil, sandalwood, shimmer lustre. 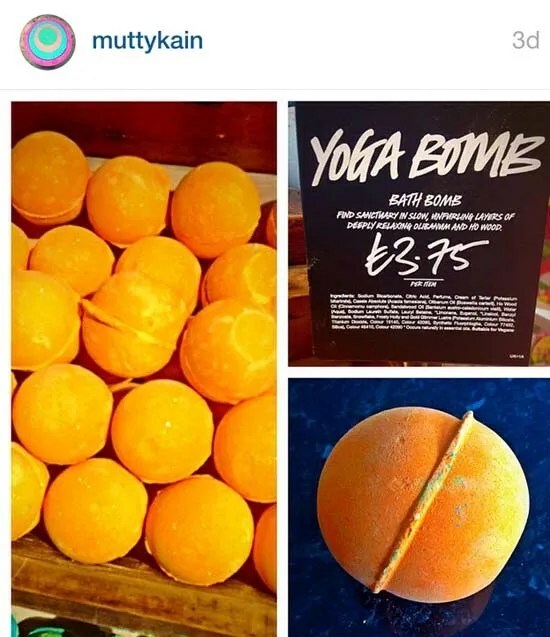 Posted on September 9, 2015 by Lushalot	• This entry was posted in Bath Bombs, Lush Oxford Street store exclusives, New and tagged glitter, gold, ho wood, lush oxford street, lustre, New, olibanum, orange, rainbow, shimmer, sparkle, yoga bomb. Bookmark the permalink.